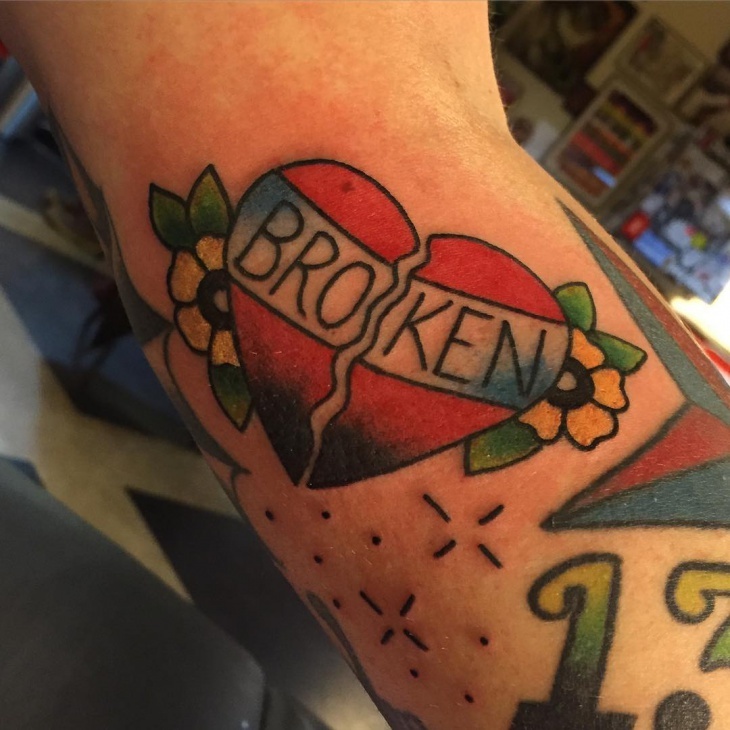 This broken heart tattoo design can symbolize a failed relationship, loss of a dear one or unrequited love. It features a red broken heart symbol with the word “broken” and is surrounded by colored flowers. Interlocking heart tattoo represents the strong bond you have with your significant other. 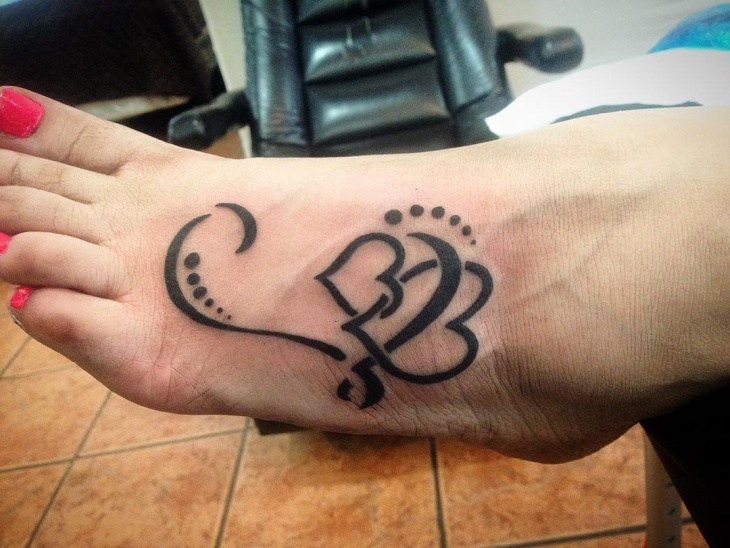 This tribal heart tattoo is inked on foot using black ink and adds dots which personalize the design. Devoted Christians view the image of the sacred heart as a reminder of Christ’s suffering. 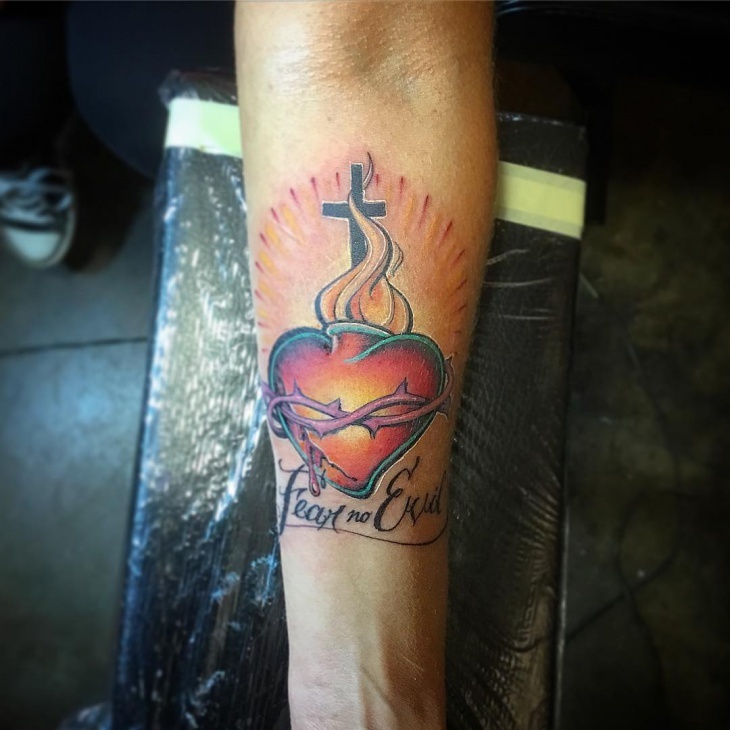 If you need to equate your pain to that of Jesus then this sacred heart tattoo design is for you. 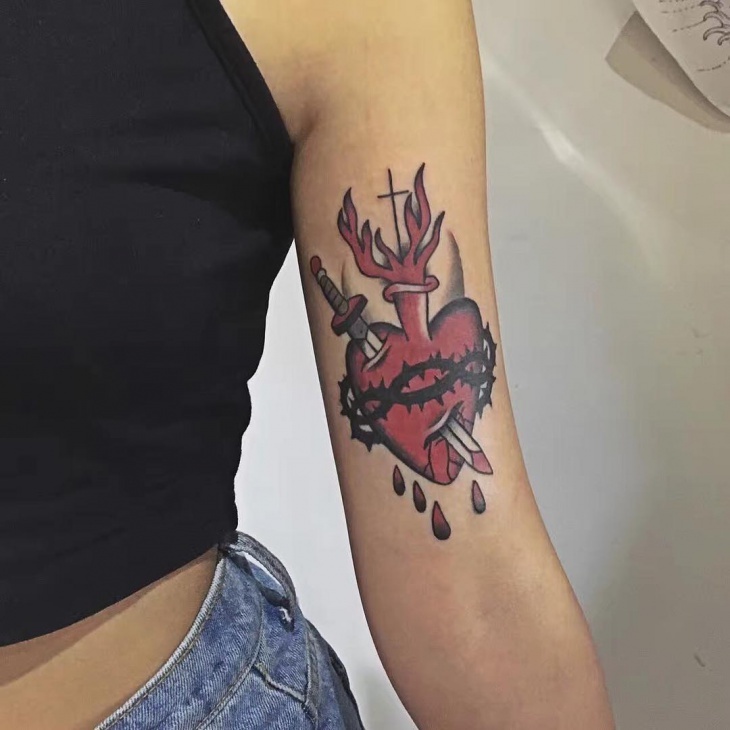 Placed on the arm, this bleeding heart tattoo depicts lost love while the addition of the cross on top symbolizes faith. 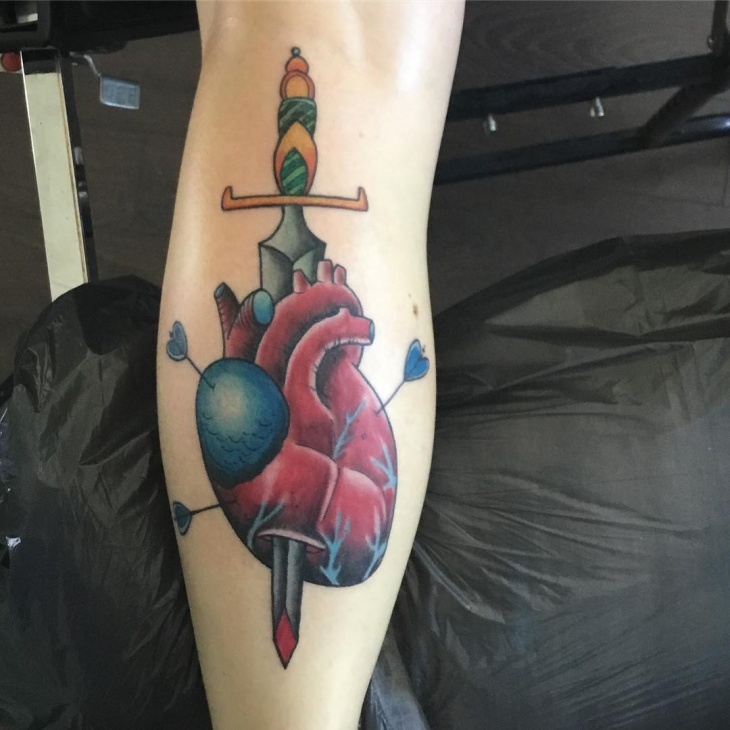 It features a dagger penetrating a heart which is surrounded by a band of thorns. Suitable for girls, this heart tattoo designs incorporates a ribbon, key, and locket in a gray color. 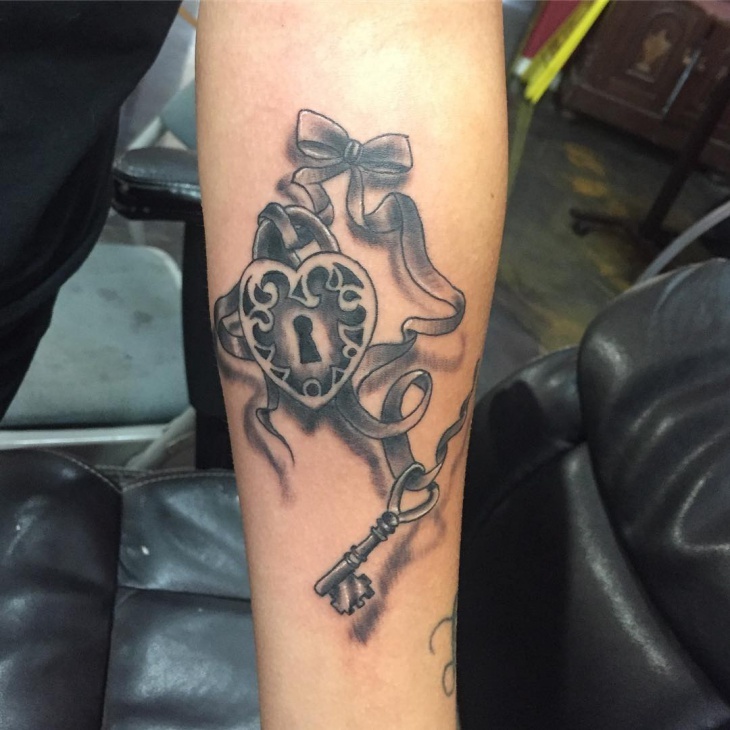 You can use this tattoo to indicate that only you have the key to your heart. A simple heart design sometimes is just what you need to make a statement. 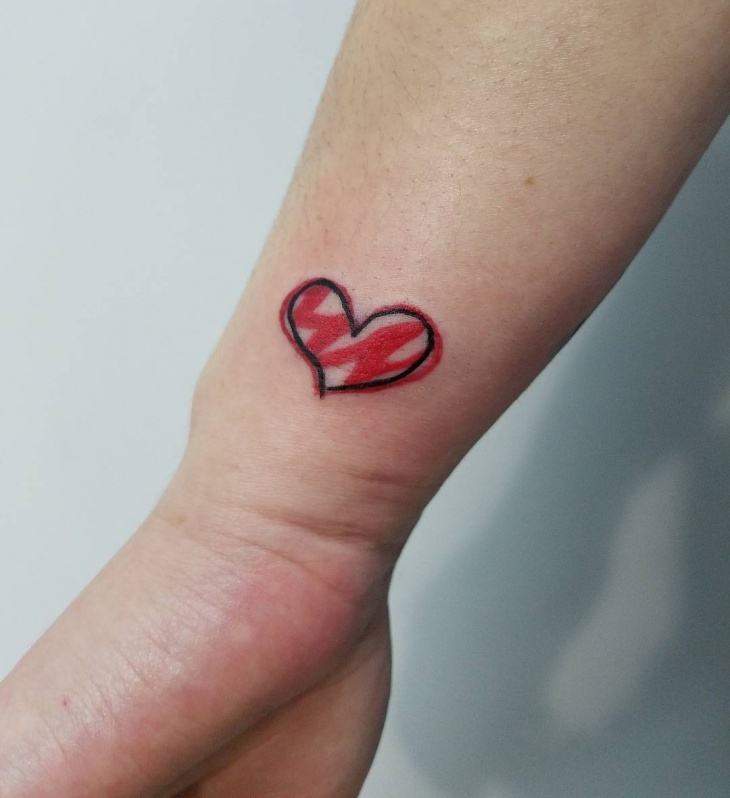 Ideal for both boys and girls, this small heart tattoo design, is on the wrist and is surrounded by a red ink shade. Lovers who need to demonstrate their commitment to each other can do so using this double heart tattoo design. Include both your names and add cute flowers to personalize the tattoo. 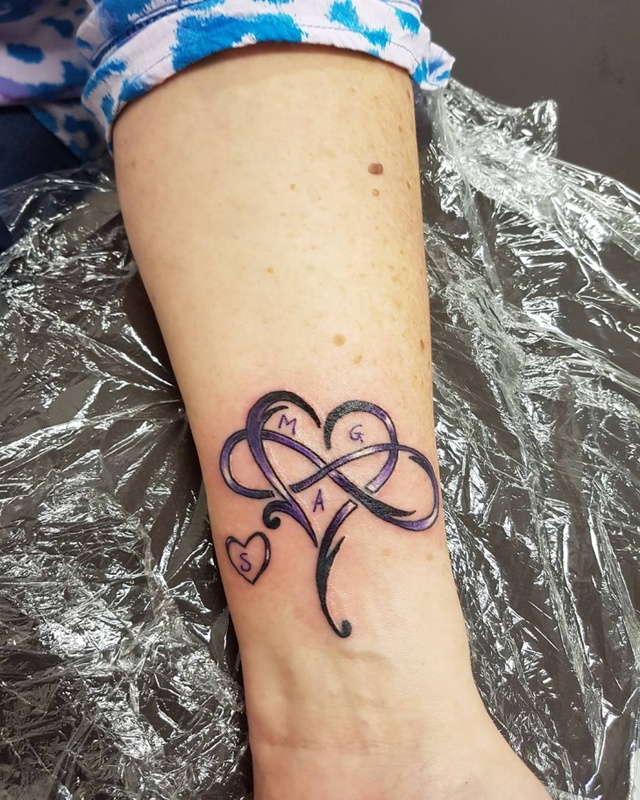 This purple infinity heart tattoo design is gorgeous and shows everlasting love. The initials of the loved ones are included in the heart to show the strong bond. A butterfly is a majestic and colorful insect. So turning it into a heart symbol not only shows creativity but also shows metamorphosis. The bright colors make the design eye-catching. 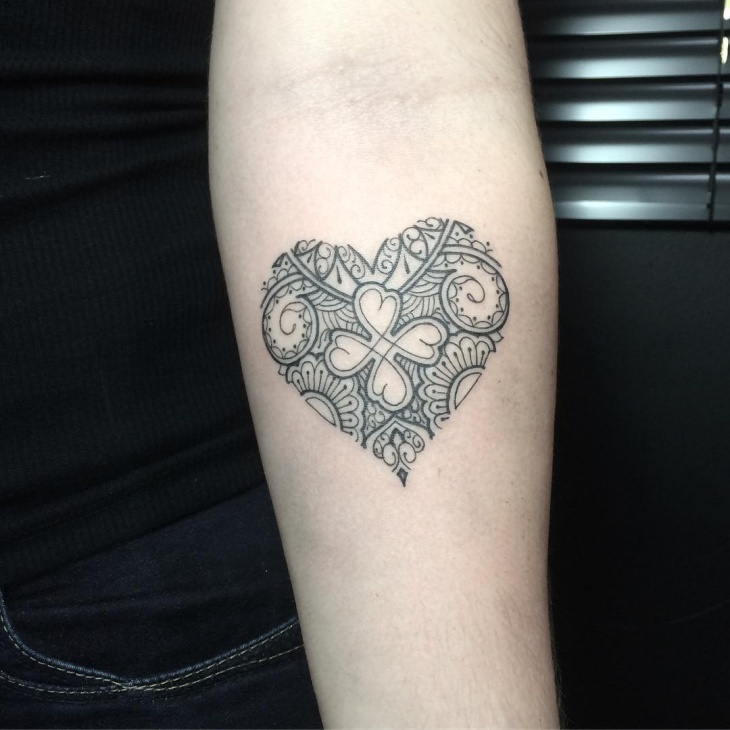 While a traditional heart tattoo design is a symbol of love, this design can still hold a deeper meaning. 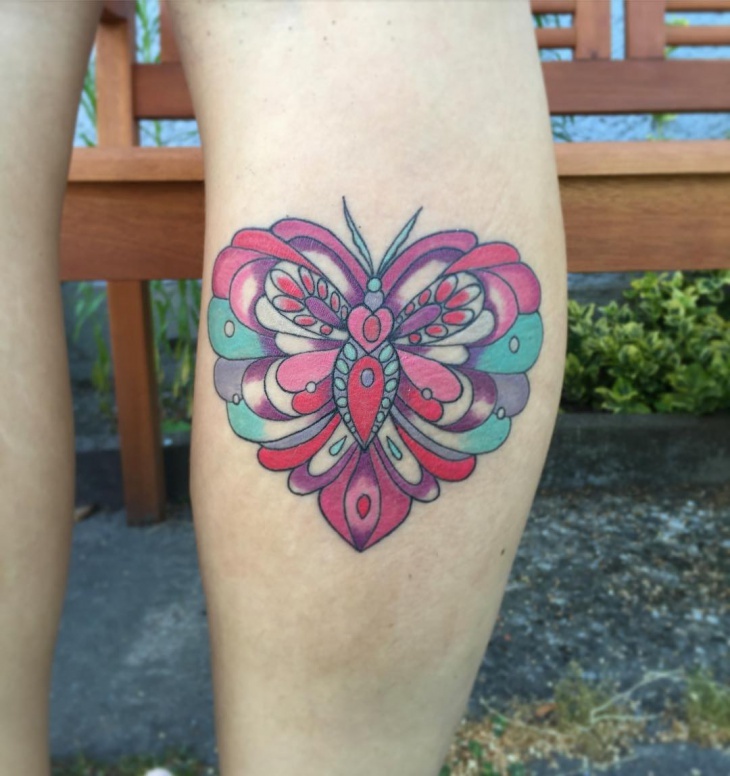 This tattoo mixes intertwining lines and a beautiful floral pattern. 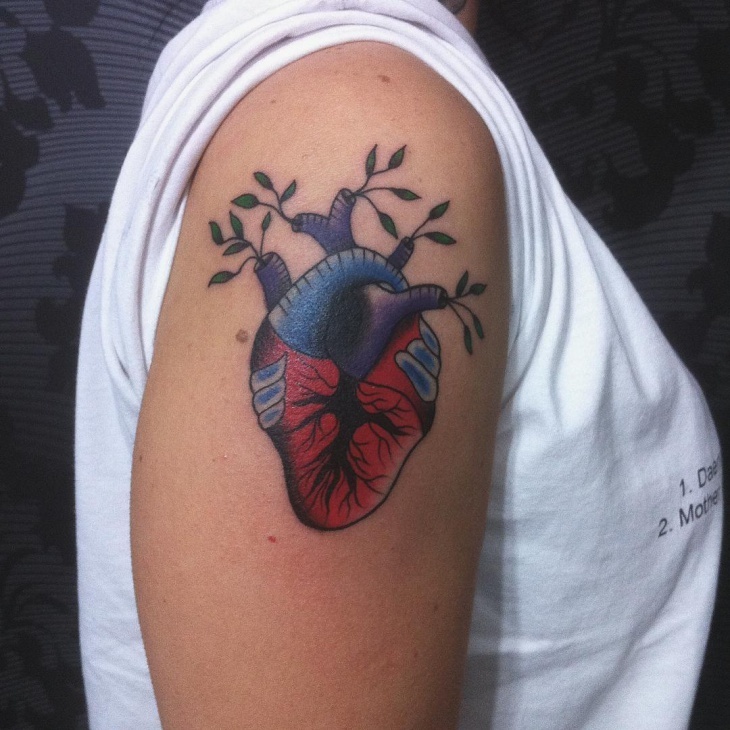 This anatomical heart with tree tattoo design depicts that the individual’s passion is still growing or how love adds life. The contrasting blue and red color and anatomical design make this tattoo attractive. Perfect for ladies, this 3D heart tattoo design features yellow flowers which add beauty. 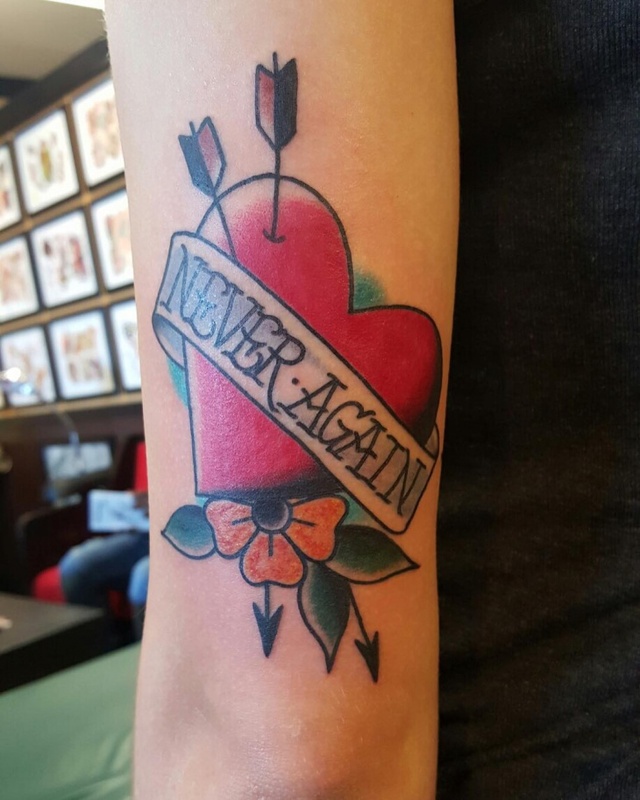 The “never again” text depicts a broken heart that is not yet ready to love again. A heart with wings tattoo design is ideal for remembering a loved one who has passed away. The gold color portrays angelic wings while the bleeding heart will show that you’re still brokenhearted. 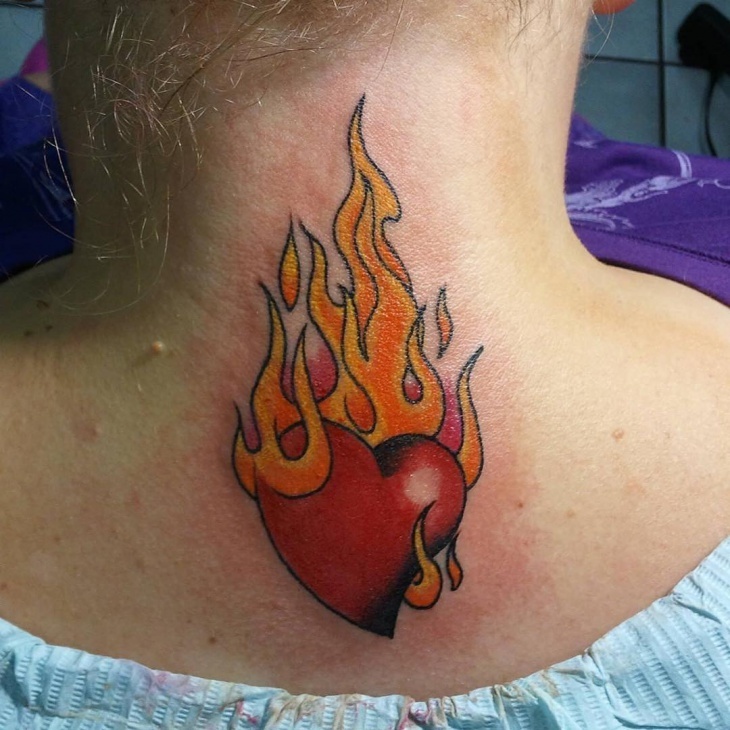 This flaming heart tattoo is simple yet beautiful. It features a bright red heart with orange flames above the love symbol which represents that you are passionate about whom or what you love. 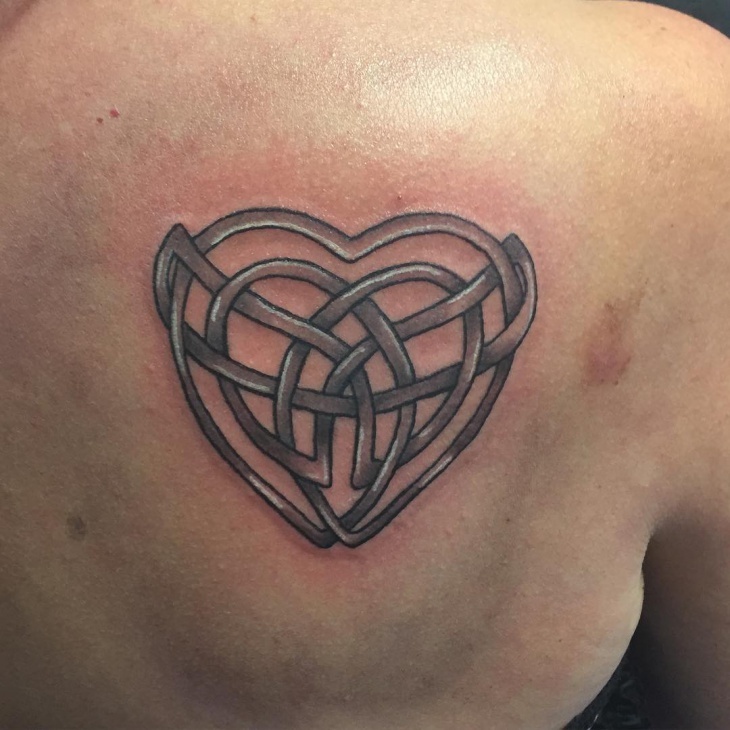 A Celtic heart tattoo is perfect for people who want to express their love for Celtic culture. You can still use this gray Celtic heart design to show how deep you love to your partner or child. Red is a color of passion, love, seduction as well as danger. 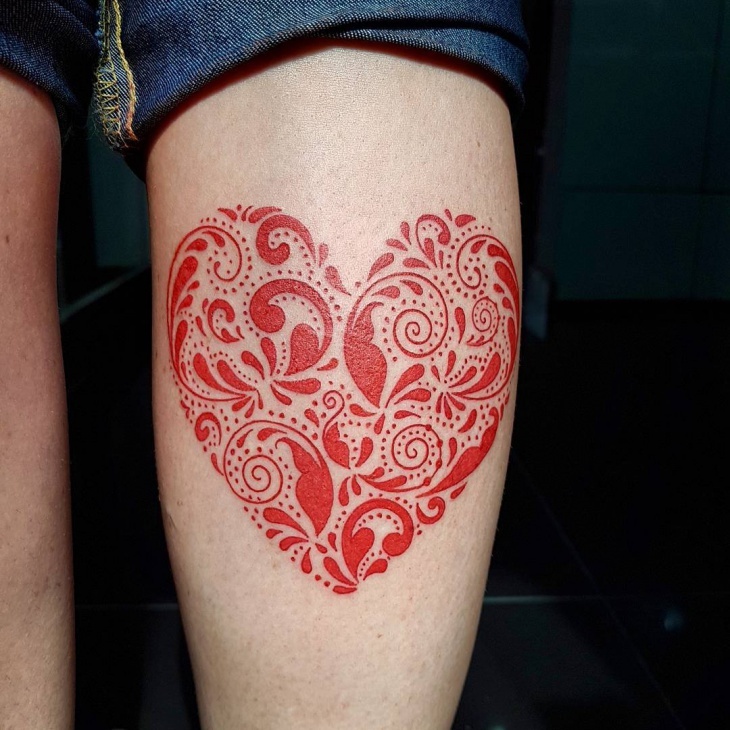 Suitable for men, this red heart tattoo design uses a floral theme to enhance the beauty of the person’s leg. Both young and mature people enjoy listening to music. 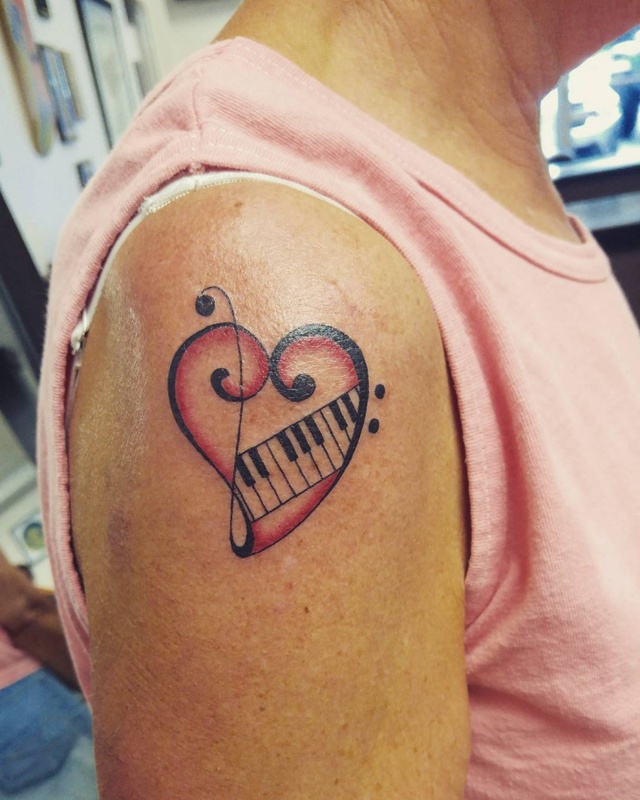 So why not show your love for the music that you love by getting a music heart tattoo design on the arm. 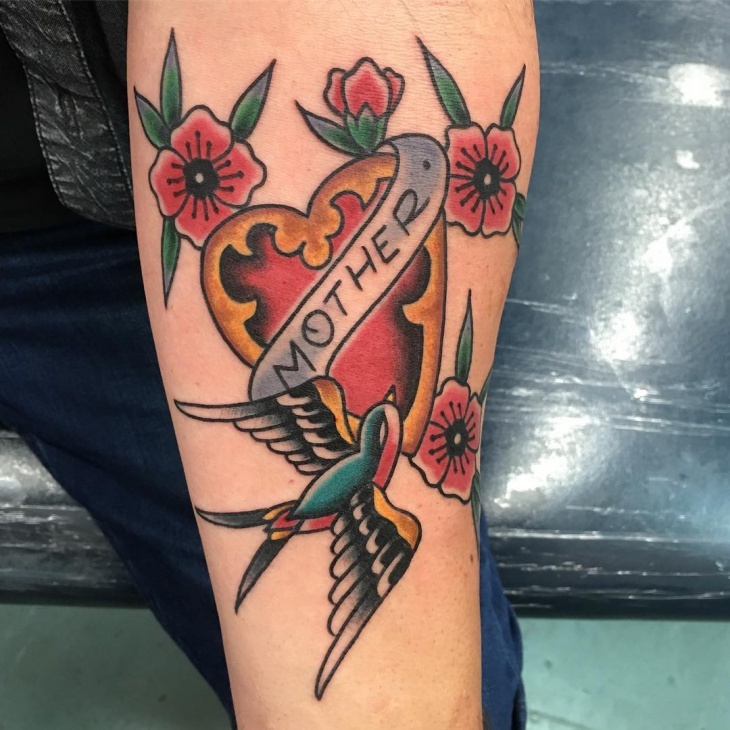 The beauty of personalizing a mom tattoo is to add the word “mother” and her favorite type of flowers. The word is in bold block letters, and the flowers are red in color. This heart and dagger tattoo is perfect for men who want to reveal their strength. Thrusting the dagger into the heart shows betrayal or a broken heart. 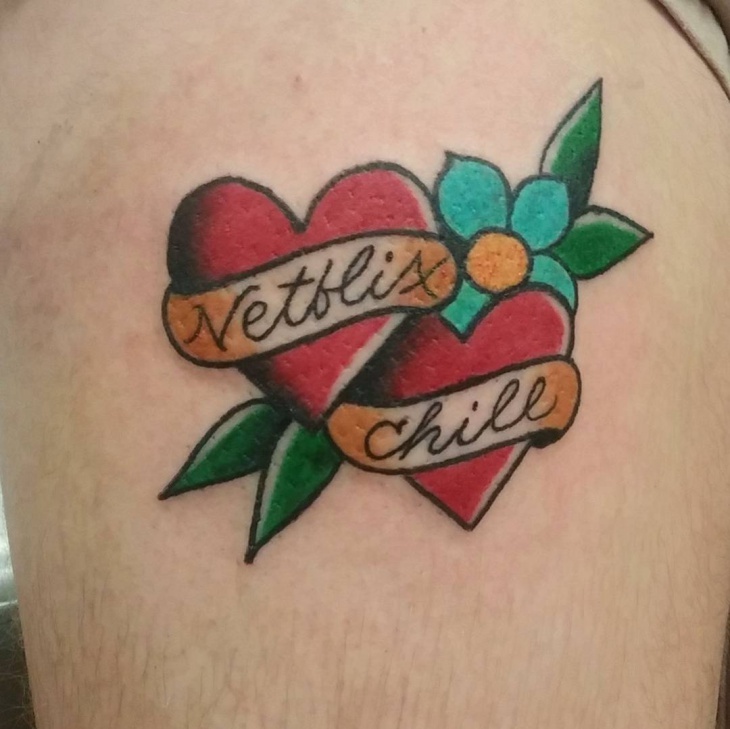 Either way, this tattoo is well designed. An open heart tattoo design symbolizes that you are willing to love. Simple yet eye-catching this tattoo design is on the wrist, is done using black ink and has thick shadings. 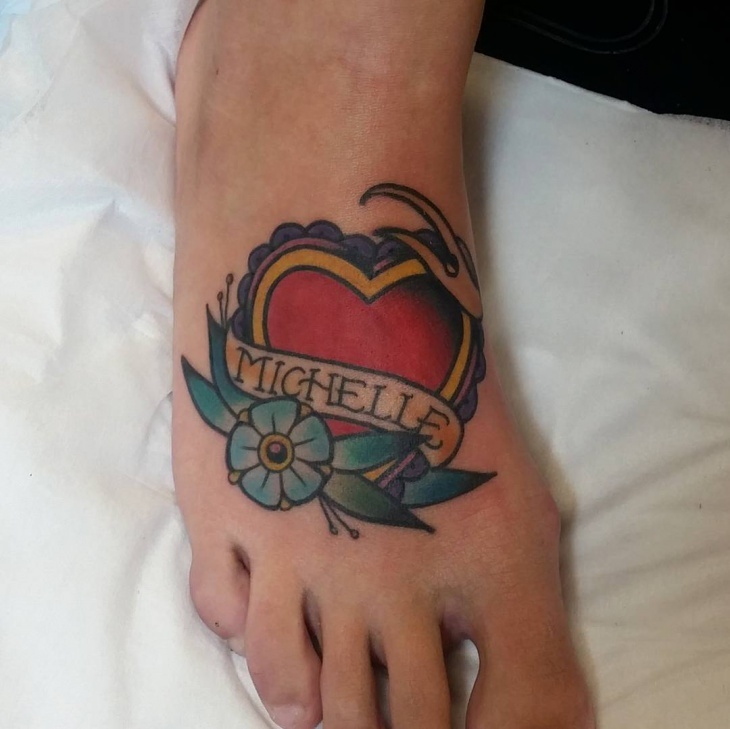 This colorful tattoo will look good on the foot of either a man or a woman. It blends more than three colors and the name of someone special is included to make the tattoo unique and stunning. Heart tattoo designs symbolize love, passion, heartache, suffering, and stability. 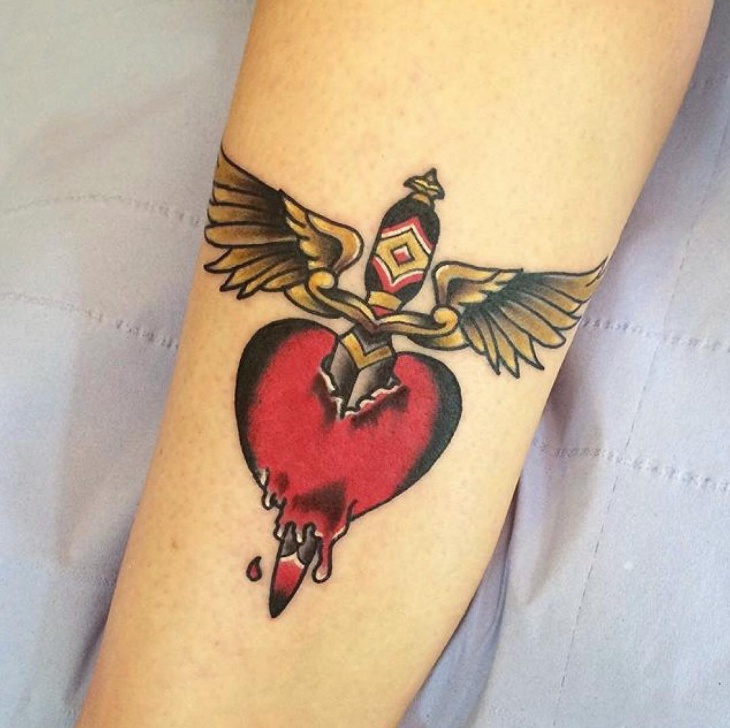 With so many heart tattoo designs available, artists are finding new ways to reinvent this tattoo. A dagger or a knife is a weapon which when thrashed into a heart gives a meaning of betrayal. Adding flowers enhances the beauty of the design or represent femininity. Heart tattoo designs are ideal for girls and guys who want to express how they are feeling in a creative way. 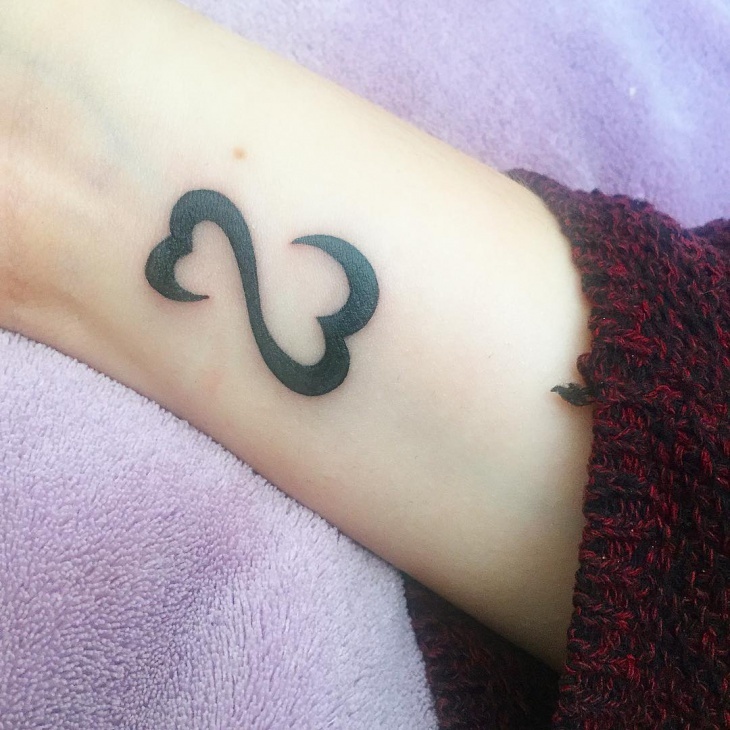 Whether you need to show heartache or prove you are committed to your better half, there is a heart tattoo design that will make you look attractive and merge with your emotions.